Je me reconnais tout à fait dans ton introduction: certains vêtements prennent des mois à être mis une première fois, souvent parce que je crains pour le confort et que je les trouve trop “voyants”. Comme je l’avais déjà dit sur Instagram, je trouve cette robe superbe ! Encore merci! 🙂 Je n’oublie pas ma promesse: je te décalque le patron du corsage dès que je peux! Pour ce qui est de ne pas oser porter certains vêtements pendant si longtemps, ça m’arrive assez rarement heureusement, mais c’est vrai que j’ai toujours une toute petite dose du même stress avant de porter pour la première fois un vêtement que j’ai fait: et s’il n’était pas confortable? Et s’il me boudinait? Et si j’avais l’air con dedans?… En gros, et s’il était raté en fait?! 😀 C’est bête quand même! Such a pretty dress. So beautifully made as well. I too have a dress that I made last summer that I haven’t worn yet for fear of it being too fancy / not appropriate for a range of events. I need to get over that and just wear it!! Yes, do wear it! It would be a shame not wearing it after so much work! Awesome dress! I love the teeny tiny bows and the patch pockets. The fit looks really good too so I wouldn’t worry about specific fitting knowledge. Your natural instinct has worked well. Hahaha, natural fitting instinct, now that would be nice! 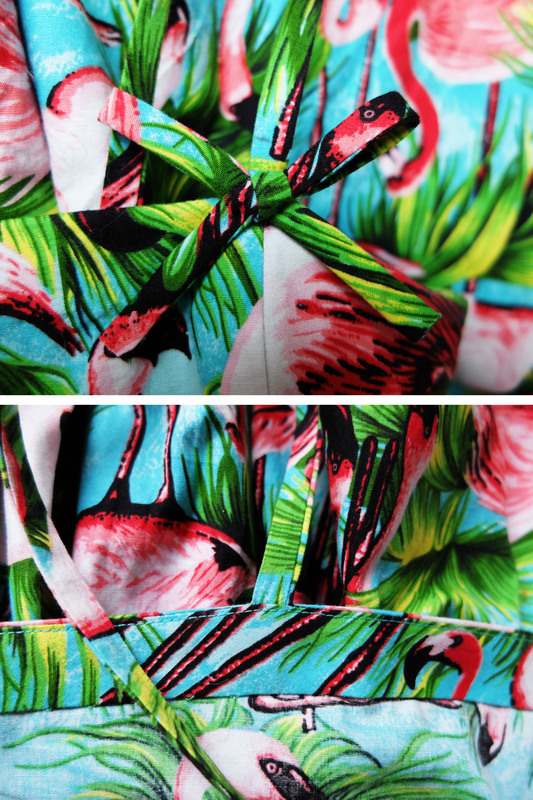 I noticed (because I was looking for it) that you didn’t match the pattern across the side seams or at the pockets. Was this a deliberate choice? I recently made a matching pencil skirt and peplum top in a large-scale floral, and I wasn’t sure if it was worthwhile to try matching the print. Ultimately I decided not to because it would have taken more time and I didn’t have access to more of the fabric if I messed up the cutting, but I’m curious how others make the call when it’s not something like stripes or plaid. You know what? I didn’t even think about matching the side seams! 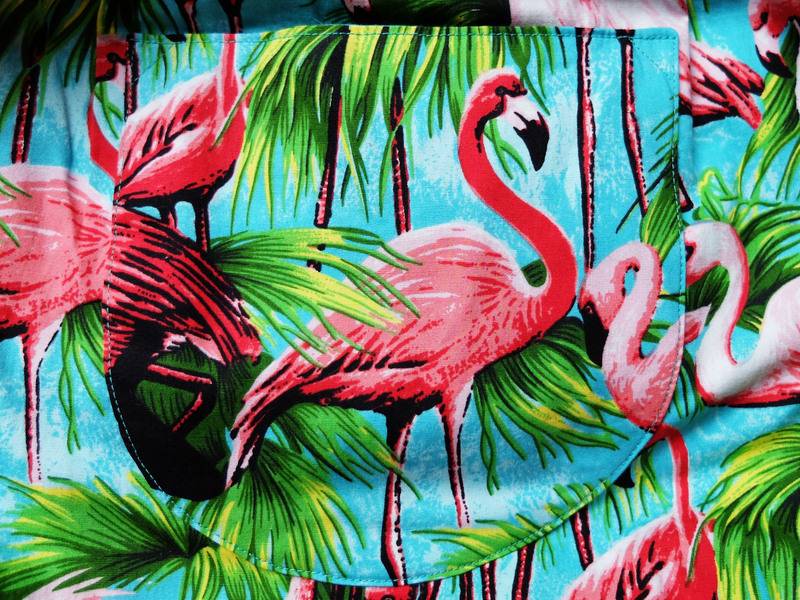 I did think about it for the pockets, but I preferred not to both for the pockets to ‘pop’ more against the background of the skirt and because I liked the idea of featuring some of the cutest flamingos on the pockets. C’est vrai qu’elle est superbe cette robe!!! Quel tissu incroyable, aussi! Merci beaucoup! 🙂 Ce tissu est tellement fabuleux!